Our surveyors leave little to the imagination! Brennan’s hydrographic surveys leave little to the imagination. We use state-of-the-art positioning and multi-beam sounding equipment operated by surveyors who specialize in hydrography. Our custom survey vessels are specially designed to access shallow areas and can collect data right up to the structure. Brennan can also facilitate surveys from boom trucks in high-flow conditions to provide real-time monitoring. 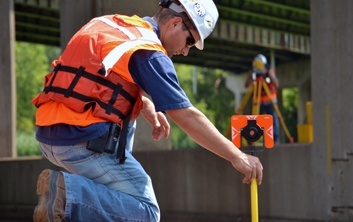 Headed by a licensed hydrographer, the Brennan bathymetric survey department often teams with owners and engineers alike to gather critical data to model and analyze conditions around bridge structures and seawalls. Using RTK-GPS for precise positioning, multi-beam echo-sounders for depth measurement, and ancillary sensors to account for the various movements of the vessel, our surveyors can collect very accurate data sets that can be used to develop detailed models of the river bottom. These models can be used to calculate volumetric quantities of scours holes, voids, and sediment build-up to a high degree of accuracy. Deliverables will include full color digital images, georeferenced data sets, and 3-dimensional models that give the viewer a lifelike view of bottom conditions. J.F. Brennan Company specializes in marine construction projects throughout the inland waters of the United States. 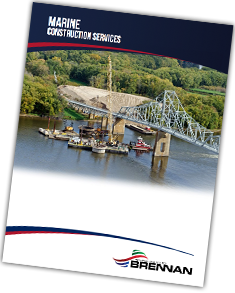 Download our brochure here to learn more about our hydrographic survey capabilities and other services that we offer. Want to know more about our survey services? Please fill out the form below!